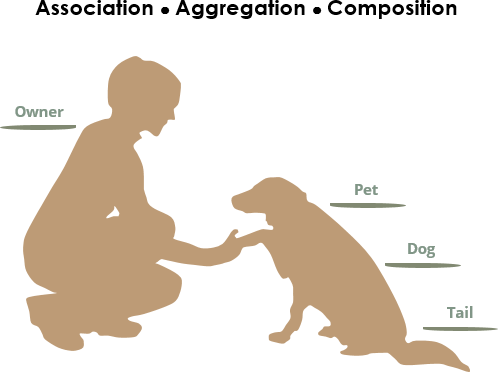 Consider the differences and similarities between the classes of the following objects: pets, dogs, tails, owners. The figure below shows the three types of association connectors: association, aggregation and composition. We will go-over them in this UML guide. The figure below shows a generalization. We will talk about it later on in this UML guide. If two classes in a model need to communicate with each other, there must be link between them, and that can be represented by an association (connector). Association can be represented by a line between these classes with an arrow indicating the navigation direction. In case arrow is on the both sides, association has bidirectional association. We can also indicate the behavior of an object in an association (i.e., the role of an object) using role names. The question "What is the difference between association, aggregation and composition" has been frequently asked lately. Aggregation implies a relationship where the child can exist independently of the parent. Example: Class (parent) and Student (child). Delete the Class and the Students still exist. Composition implies a relationship where the child cannot exist independent of the parent. Example: House (parent) and Room (child). Rooms don't exist separate to a House. It's important to note that the aggregation link doesn't state in any way that Class A owns Class B nor that there's a parent-child relationship (when parent deleted all its child's are being deleted as a result) between the two. Actually, quite the opposite! The aggregation link is usually used to stress the point that Class A instance is not the exclusive container of Class B instance, as in fact the same Class B instance has another container/s. To sum it up association is a very generic term used to represent when on class used the functionalities provided by another class. We say it's a composition if one parent class object owns another child class object and that child class object cannot meaningfully exist without the parent class object. If it can then it is called Aggregation. Generalization is a mechanism for combining similar classes of objects into a single, more general class. Generalization identifies commonalities among a set of entities. The commonality may be of attributes, behavior, or both. In other words, a superclass has the most general attributes, operations, and relationships that may be shared with subclasses. A subclass may have more specialized attributes and operations. For Example, a Bank Account is of two types - Savings Account and Credit Card Account. Savings Account and Credit Card Account inherit the common/ generalized properties like Account Number, Account Balance etc. from a Bank Account and also have their own specialized properties like unsettled payment etc. Generalization is the term that we use to denote abstraction of common properties into a base class in UML. The UML diagram's Generalization association is also known as Inheritance. When we implement Generalization in a programming language, it is often called Inheritance instead. Generalization and inheritance are basically the same, the terminology just differs depending on the context where it is being used. Do you want a UML tool that can help you learn UML faster & more effectively? Visual Paradigm Community Edition is a free UML software that supports all UML diagram types. Its UML modeler is award-winning, easy-to-use and intuitive.